We work all projects from a transversal perspective. You explain us your values, strategy and we always ask ourselves: ¿how is your client going to see you, by car of by foot? ; ¿when is your client going to visit you: at a fair, during his/her mid break or weekends, with family? ; ¿what are they expecting? ; ¿which experience can be associated to your values? ; the answers will define what kind of space you will need to create. We translate your graphic elements logo, colours, tipography and added value into the space design. The perfect way for up-and-coming brands and designers keen to experiment and interact with their audience, and also for established ones wanting to make an impact by using a new code/language. "Inspired by Dada movement, any material could be the future "
We started working how visitors explored architect@work, we knew that people had trouble to see the material exhibition, also held during those days. 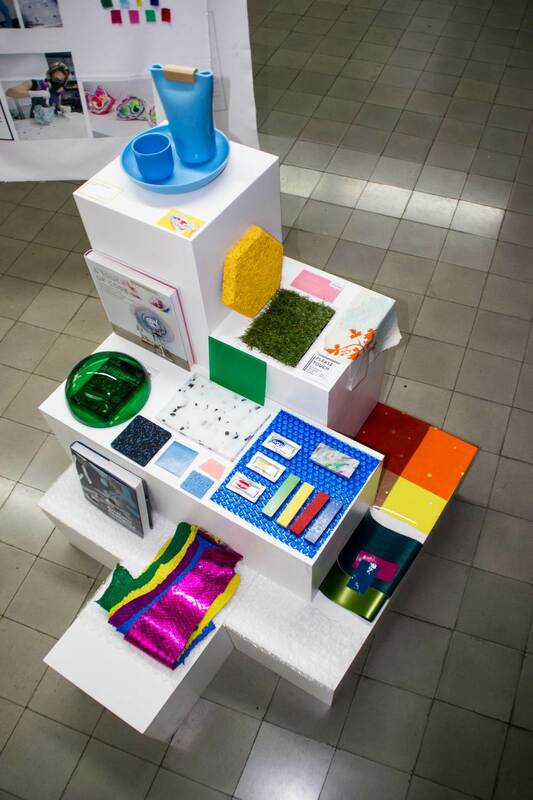 So we had to think in two scales: first display’s layout and second material’s scale. Our focus was to catch visitor’s eyes, so we created two suspended sculptures getting their attention from any point. 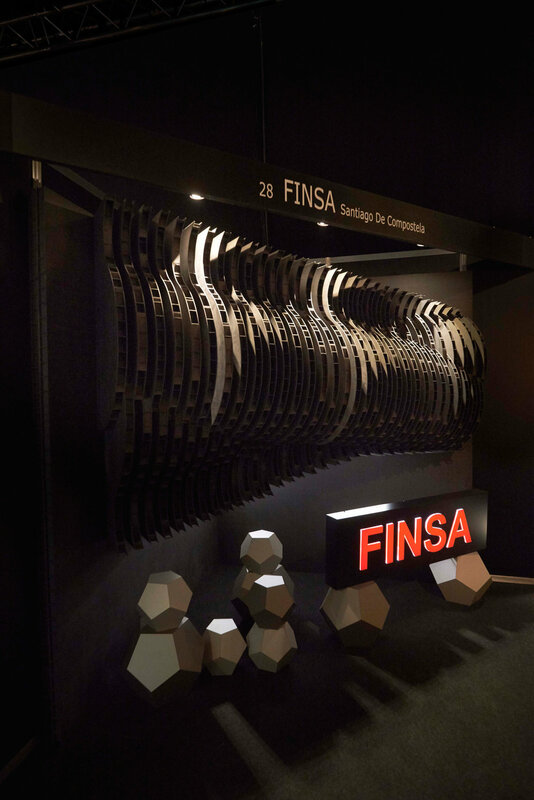 Our starting point was Man Ray’s Obstruction Sculpture, we assembled 43 wood hang coaters avoiding the kinetic effect, because we wanted to reinforce the circular concept, used to design the exhibition layout. 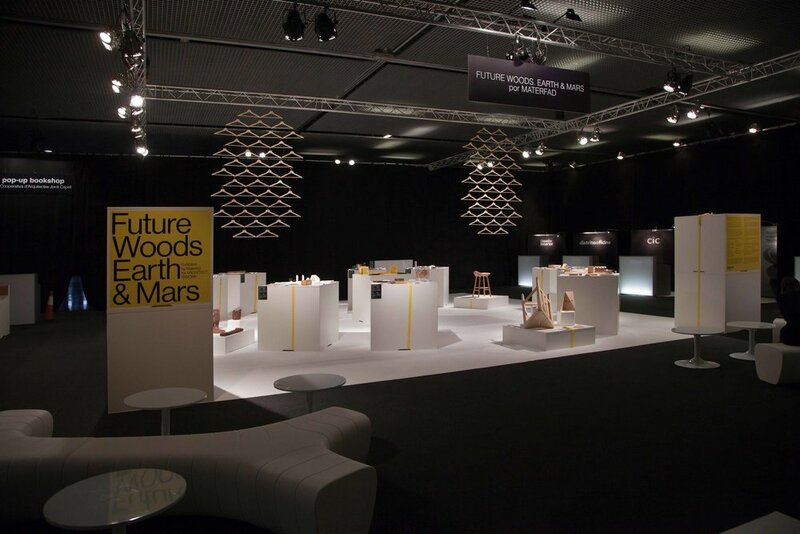 In order to show innovative projects in a different perspective, we displayed them at 25 cm high while materials where shown at 1m high, easier to touch them without needing to lower yourself; two 2 meters’ high totems signaled the entrance of the exhibition playing with the graphic design. Create movement by playing with the heights. Yellow ratchet tie down straps were used as a metaphor holding back the world’s future. The exhibition was designed so it could be used in both Barcelona and Madrid, reusing the same fixtures. "We empowered the unique distilling process at low temperature"
This interior project had to fulfil two very different needs: a working space that also expressed the branding values. On one hand the Rotaval, distilling process at low temperature nearly needed a laboratory, but on the other hand all the branding of the company should have their own space. Therefore we designed a working table, but beautifully crafted and behind it we created a customized pegboard, which combined with aluminium shelving of only one millimetre; this allowed them to have a giant mood board, and display different compositions. Since we wanted to reflect that Ginraw uses latest techniques, combined with traditional methods, their logo was 3d-printed.Finally the wanted to show the botanicals in a different way, not self-contained; four of them are used fresh (lemon, kefir lime leaves, citron, laurel leaves) because their essence is extracted by Rotaval. So we showcased them in a marble ring, author design to emphasize premium gin. 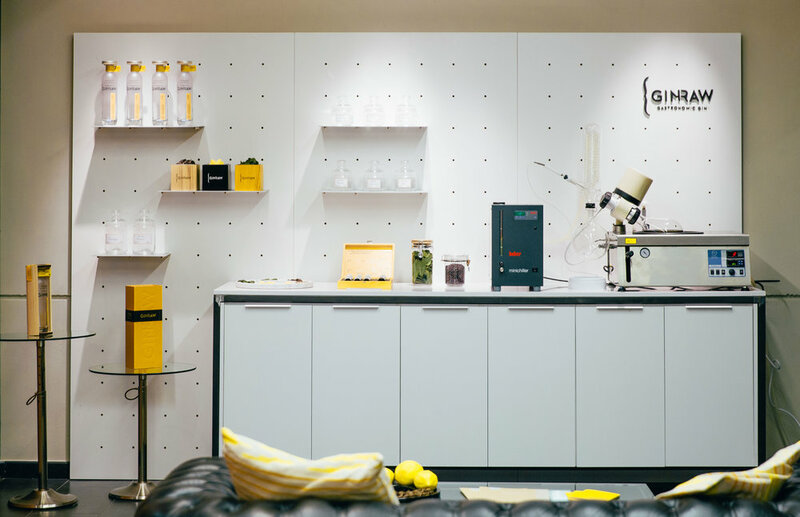 "We created a stand to inspire and help new products to be introduced"
The biggest challenge was to make an impact with a special exhibition format 2,5 sqm x 2,5 sqm, among 100 providers. We found inspiration at the installation “Part to Whole” by HG-A. So a suspended sculpture made of GREEN PANEL was built to explain the lightness and resistance of the material. We draw the pieces, which individually seen remember the piano hammers. The structure was created by the projection of this “hammers” in two rows that move in opposite directions. This sculpture seems to protect a garden of gems; 9 dodecahedrons made of COMPACTMEL finished in MOKA and VISON to inspire their use in restaurants, hotels. desigmed, a brand that vouches for good design, launch. "We wanted to show industrial design in a different way"
It was a big success 170 person from a wide profile assisted. Our goal was to attract people related to the design sector (architects, interior designers, retailers and students) but also those who consider themselves as curious and with a great sensibility. Esther Rico studio is copartner of this project. We tried to show industrial design from a different perspective. The guests were welcomed by a wall composed with more than 100 pieces painted by Edjinn, urban artist, and a video that explained the Faceta’s manufacturing process; it is a limited edition of the product realized by Francesc Gasch Studio, Rosa Cortiella creative contemporary ceramic and Edjinn. Mosaic was the concept we used to explain what was the event focus: the designers and their pieces. Double sided flyers in order to let people know them better as personas and therefore their product. "Experience materials directly, guided through the near future trends." Laura needed that people touched, experienced the materials, to reinforce the value of being physical; you can read books that talk about materials, but you need to touch them to learn about their true nature. So we designed bespoke MD modules, 6 units for each trend that disposed as a Lego, created 6 areas. 36 units, all have the same dimensions, which combined created different levels of interaction with the visitors. Printed textiles hanged from the ceiling showed the mood board that inspired each trend and the materialist that better explained it. The temporary exhibition took place in a space that usually is the office of different creatives during BDW15 (Barcelona Design Week).